In the run up to Copenhagen, how do we get a global agreement on climate that truly puts climate justice at its heart? How do we respond to the jobs crisis and growing poverty around the world? How do we ensure the global green new deal the world needs? How we do we show that cuts are not the only option, and demonstrate what Putting People First really looks like? Come and join us at the Put People First G20 Counter Conference. We're bringing together academics, activists, campaigners, unions, policy makers and YOU to share ideas on what the alternatives are to cuts, cuts and more cuts, and how we must organise across our issues, of jobs, justice and climate, to make the alternative the reality. After marching for jobs, justice and climate in March and debating how we put people first. Sign up for the conference now! 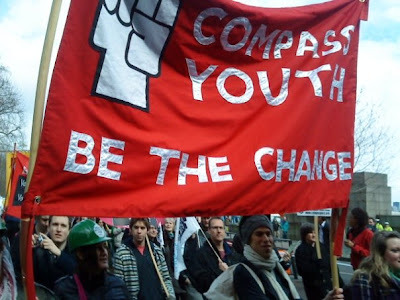 After marching for jobs, justice and climate in March and debating how we put people first, Compass Youth will be taking part by hosting the afternoon session on How do we mobilise activists to campaign with Jon Cruddas MP, John Harris (The Guardian), Climate Camp and Noel Hatch (Compass Youth). There'll also be sessions through the day with an amazing line up of speakers, including: Tony Juniper (Princes Rainforests Projects), Poul Nyrup Rasmussen (Former Danish prime minister and president of the PES), Jon Cruddas MP, Deborah Doane (director of World Development Movement), Billy Hayes (general secretary of Communication Workers Union), Caroline Lucas MEP (leader of the Green Party), Diane Elson (University of Essex), Jesse Griffiths (Bretton Woods Project), Noel Hatch (Compass Youth), John Hilary (War on Want), Catherine Howarth (FairPensions), Neal Lawson (Compass), Larry Lohman (The Corner House), Sarah-Jayne Clifton (Friends of the Earth), Andrew Simms (new economics foundation), Glen Tarman (BOND), Hilary Wainwright (Red Pepper). In March, we marched in our tens of thousands to demand the G20 Put People First. Far from putting people first, we’ve seen nothing but a tinkering around the margins followed by the return to business as usual. On Nov 7, as the G20 returns to the UK, the agenda on the table nurses an already failed economic model back to life, whilst looking to sew up an unjust international climate deal outside the UN process. They bailed out the banks to the tune of billions, and now the only choice offered is what cuts are made to pay for it. Government intervention to create a Green New Deal is slipping off the agenda, and yet strong alliances are forming - environmentalists and trade unionists have been standing side by side at Vestas to save the UK’s largest wind turbine factory. "The irony of the crisis, is that its the people with the most vulnerable working and living conditions who were already victims of corporate and neo colonialist greed, who are still being left out in the cold. We bailed out the banks but forgot to bail out the people. It's time to take back society, it's time to save our future." Book your FREE place now for an inspirational day of discussion and organising and help spread the word. This conference is supported by ActionAid, Action for a Global Climate Community, BOND, Bretton Woods Project, Change is Coming, Compass, Compass Youth, Ekklesia, Fairtrade Foundation, Friends of the Earth, Global Call to Action Against Poverty, GMB, Helpage International, Jubilee Scotland, Jubilee Debt Campaign, National Union of Teachers, new economics foundation, New Internationalist, People and Planet, Progressio, Stop AIDS Campaign, Stop Climate Chaos, Stamp out Poverty, Trades Union Congress, UNISON, WILPF, World Development Movement, War on Want and WWF-UK. WHAT CLIMATE CHANGE CAMPAIGNER ARE YOU? FED UP WITH MPS EXPENSES? VOTE FOR A CHANGE! THE FUTURE OF THE LEFT? COMPASS YOUTH GOES CLIMATE CHIC!